I think a strategic approach to harm minimization needs to be the primary focus of a drug strategy in Canada. Not the typical harm minimization strategy, but rather one that focuses on building an innovative and integrated response that recognizes that the solution to addiction is as much or more about early intervention and combating the addiction directly. It is necessary to engage partners and service providers within the youth community if we hope to develop an innovative, enhanced education and prevention program targeted at youth in schools. 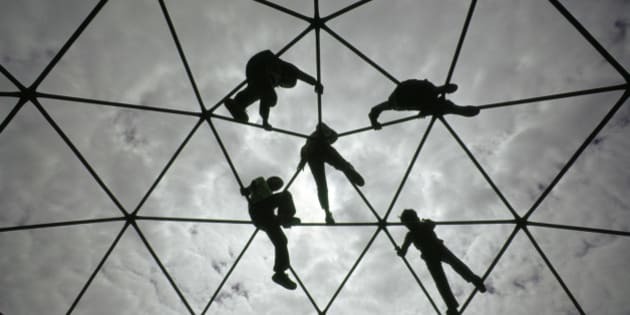 Ethnically diverse young boys and girls silhouetted against the sky while playing and climbing together on a playground Jungle Jim. Most public discussion today relating illegal/illicit drugs focuses on legalization of marijuana, the impact and what it will look like. Interesting discussion but I won't get into that dialogue as I would rather discuss what we are doing or not doing to combat drug addiction in this country now. To begin, I would like to offer the following information. There exists in Canada, the concept of a three-legged stool to combating our drug problem, similar to other industrialized nations. The primary areas include supply reduction strategies, demand reduction strategies and harm minimization/reduction strategies. This foundation has been in place in most countries for decades in one form or another so I will break it down into consumable parts. Supply reduction is referred to as prevention through law enforcement engagement and has traditionally been seen as a front-line program that targets drug dealers and importation to reduce the availability of drugs. In short it is believed that if we can reduce the number of dealers and the availability of drugs we may prevent the use as well, so this has a firm footing within law enforcement. Demand reduction has at its core a focus of reducing the desire or need for illegal/illicit drugs. This has many shapes and includes early intervention, education and measures designed to remove the users need from the equation of drug trafficking. This has its roots in most police services and combined with enforcement led programs that target dealers in hope that this will enhance the capacity to target a strategy of supply reduction. Supply and demand reduction are directly linked in an attempt to bring forward a greater potential for success. The third area is termed the harm minimization/reduction strategy and has at its core an attempt to reduce the drug-related harm felt by individuals and I would argue, communities. Typically seen as the safety net to the other two policies understanding that the other two policies will never completely attain success and that this will be the policy that can minimize risk to individuals who fall through the cracks, including programs designed and focused on the health and safety of those who are engaged in unhealthy and unsafe practices of drug use. Many want to focus on mandatory sentences or decriminalization/legalization but I think a strategic approach to harm minimization needs to be the primary focus of a drug strategy in Canada. Not the typical harm minimization strategy, but rather one that focuses on building an innovative and integrated response that recognizes that the solution to addiction is as much or more about early intervention and combating the addiction directly. With the support of all levels of government and agencies involved in developing and implementing solutions to drug addiction fully-engaged, the country will be better going forward at managing drug addiction and having a long-term impact on addiction, with such a strategy. It is hoped that such a strategy would focus energy and funding on the early intervention of addictive behaviour and tackle the problem of youth involvement in the use of illicit drugs. In Ottawa over the past seven years there has been a strategy called Support Treatment Education and Prevention (STEP) and it has successfully engaged all partners, from police to health agencies, treatment centres and educators in tackling addiction pre and post addiction. The success of STEP has been recognized locally and nationally and could be a template for a strategy elsewhere. It is necessary to engage partners and service providers within the youth community if we hope to develop an innovative, enhanced education and prevention program targeted at youth in schools. The one place we can find young people engaged in drug use are the very schools they attend, it is also the place where we can engage those youth to reduce the risk through early intervention, getting to them before the dealers do. After 32 years of policing in 16 different cities/towns, I have witnessed that schools are OUR opportunity to reduce the risk of drug abuse by young people. Research has shown that a strategy that focuses on addiction prevention and early healthy activities will also see the cost of long term rehabilitation programs for addicts dramatically reduced. In fact the various research pieces completed show that every dollar spent on such programs will show a benefit of four to seven dollars. The reduced health care costs, costs of crime and law enforcement and as well a long term healthier society are all proven results of early intervention. There is also clear and convincing evidence that early or earlier intervention in particular for youth has the greatest potential for success and lessens the potential for recidivist drug use, important in developing a national strategy. In conclusion a roadmap for success in the development of a strategy targeting and engaging addicts and would-be addicts should consist of two important components: innovative, enhanced education and prevention program targeted to youth in schools and fully funded and supported treatment programs across the country.